While our hunting season doesn’t start until tomorrow and I am working nights. I am hoping that I can find this big fella an eight pointer that wandered threw my wild apple trees last night. I know he will hang around as there is at times up to 12 does and fawns in my back field. Unless someone else gets him I will be looking for him. He is not big on the rack but he is a heavy weight. There is also 4 spikes in which one only has one long spike and a 4 pointer. Problem is I live right in town with houses all around outside my property. But I do have a good idea where he maybe hiding out at. If no luck I will be heading to camp after a pie bald that I saw up that way. Even though this heavyweight has my attention. Wish me some luck. Last edited by Phil from Maine; 10-26-2018 at 08:09 AM. Thanks Jake. I posted this to let Cal know that I have not forgotten about getting a big Maine buck to post for him. So if no luck he will at least get to see a picture of one. I know exactly what he wants though. Last year I shot a four pointer. It had the “ Y” broken of it or it would of been a five pointer. I guess a big one hit it hard. But I was quite happy with it. 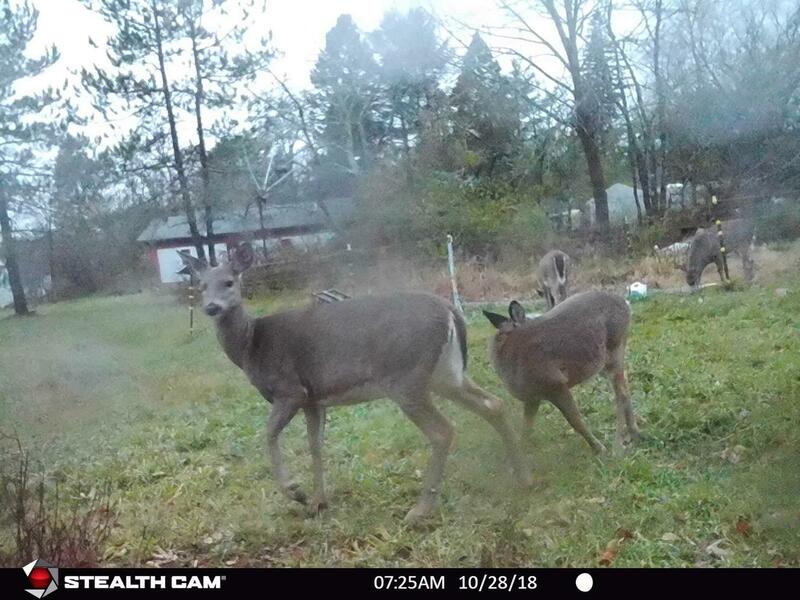 My first deer after my fight with cancer..
Nice picture Phil. Yup it is getting time for those Maine heavy weights to start to move. My neighbor is have a fun time in the woods this year. He filmed a momma bear with 4 Cubs running past him during a Wisconsin hunt. 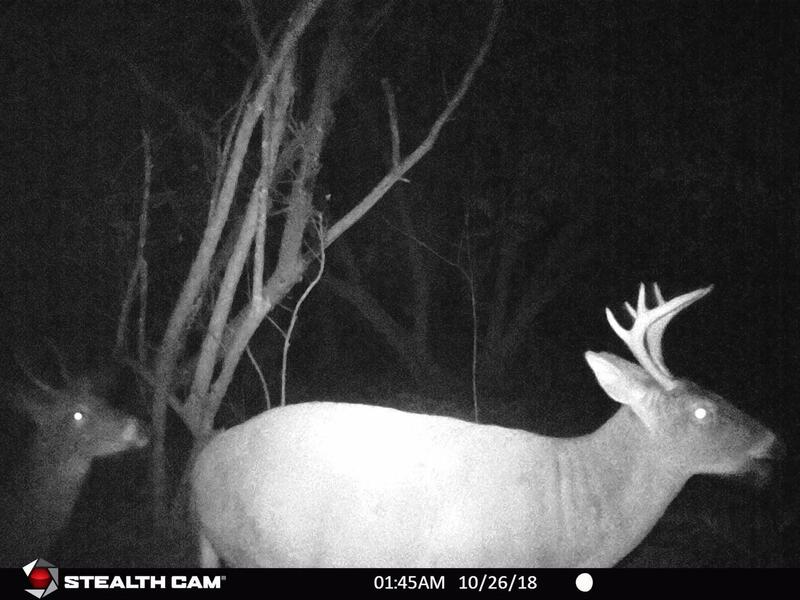 Behind my house he has a few good bucks he's chasing and the big one came buy nose to the ground on the trail of a doe that went by. Then he had a bobcat right under his tree. I told him I would have shot the bobcat and had it stuffed. good luck I don't see myself getting out this fall. I'll let my son when he get home from college and neighbor shoot them all this year. I agree with FM about the bobcat. Phil, that is one big bodied buck. Ya need to trim him from the herd this season. Good luck! Thanks Everyone and I will be trying to make a connection with him. I have a pretty good idea where he is hanging around. It will be in some pretty thick stuff and with patience it will pay off..
What, no pics of a buck down yet??? I'm rootin for ya!! Thank you but no luck yesterday and can’t hunt Sundays here. I wish that we could as they were out in the daylight this morning. As you can tell by the pictures that it would not be wise to use a rifle here in this field. But I can use my bow there will try to get him in the morning if he shows up. 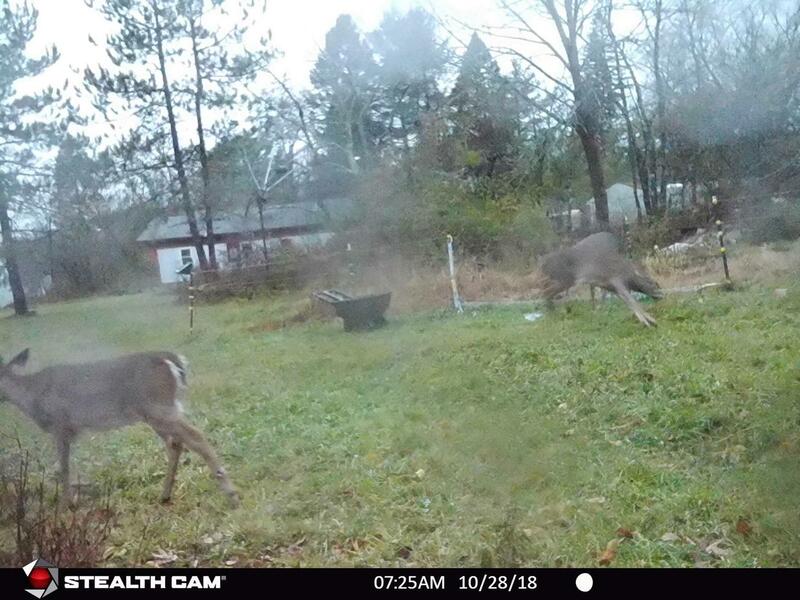 The first picture shows him just about throwing the young spike out of his way.